The Soccer Association for Youth (SAY), an affiliate member of the U.S. Soccer Federation, is a nonprofit organization for kids ages four through eighteen. Groups that affiliate with SAY are called Areas. Areas consist of one or more Districts. Districts are made up of no less than four teams and are generally divided by geographic or school boundaries. To find an Area or District in your state click here. Every player plays at least half of every game, with leagues forming balanced teams and divisions. player can be successful at the game and the modest expense required to field a team, make it possible for many children to participate in organized competition." As with the USYS and AYSO, a win-at-all-cost mentality is opposite to the basic objectives of SAY. Stacking teams and tryouts are no part of the SAY philosophy because in the long run, they will not be beneficial to the majority of young people involved. 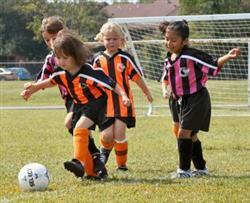 SAY teams can be competitive, but having fun while developing soccer skills is more important. For those areas that desire a more competitive program in addition to their recreational program, SAY has developed the Rec-Plus Program for players ten and older. Rec-Plus Program keeps its roots in recreational soccer by requiring all children to play a minimum of half the game, just as all other SAY teams must do. Players for this program may be selected according to their abilities. The Rec-Plus season must not interfere with the primary rec season and all Rec-Plus teams are formed by blind draw from a player pool to keep teams on an even playing field.